To be a successful mountain biker it’s not enough to just have speed and fitness. You must also possess a certain degree of technical riding ability and bike handling skills. Carrying speed through technical sections, climbing steep switchbacks, and navigating roots and rocks are part of most every off-road ride. In the same way you train to be more aerobically fit, you can also work on refining your handling ability to become an all around more competent rider. Integrate these 10 things into your riding to improve your mountain biking skills, and become a more well-rounded MTB athlete. 1. Ensure that your bike is setup properly. 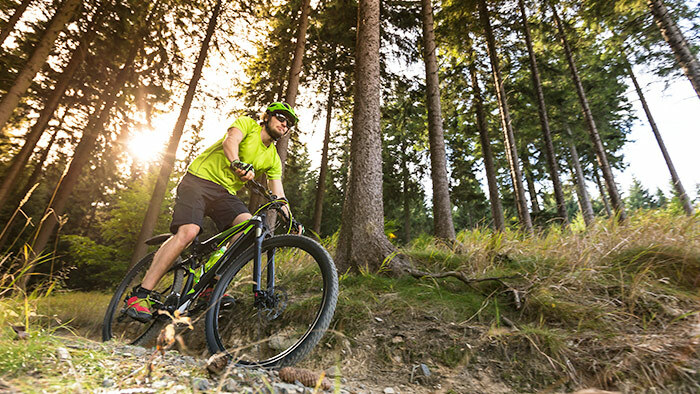 Take advantage of advancements in MTB technology with things like dropper seatposts, adjustable suspension, modern trail geometry, tire offerings, thru axles, brakes and much more. When your bike fits you, and you have the parts capable of handling any terrain, you’re going to feel more confident and comfortable regardless of what the trail throws at you. 2. Pick the right riding partners. If your goal is to grow as a rider, then spend time with people whom you’re comfortable riding with. Your group should both push you to be better, as well as support your growth as an athlete. You shouldn’t feel embarrassed to try new things, or pressured to ride above your ability level too quickly. A good group of friends goes a long way in helping you become a better rider. 3. If you can’t ride a section of trail, keep trying! Don’t be afraid to stop and “session” a technical area during your ride. Maybe it’s a steep downhill, rocky climb, or tight corner that keeps throwing you off. Analyze the section and work on line choice and trying new positions on your bike until you “clean” it. The only way to get better is to ride outside of your comfort zone. 4. Don’t forget about the climbs! Most often when we think about technical trail riding we envision riding downhill. However, it’s just as important to be competent on steep and challenging climbs as it is during descents. Body positioning, gearing, and pedaling efficiency are key for these types of climbs. Maintaining a neutral position on the bike, and a smooth and powerful pedal stroke, will often get you to the top of most rock or root-strewn climbs. 5. Learn to be comfortable out of the saddle. Whether you’re shifting your weight back for steep descents, sprinting, or lifting your bike over a rock—mountain bikers spend a lot of time out of the saddle. Get comfortable in this position, and learn how to properly position your body in relation to the bike. The goal is to transfer weight to your pedals, and to remain light on the handlebars. 6. Cadence and efficiency are two keys to good riding. The more efficient and smooth you are in and out of the saddle, the better you’ll be able to handle technical terrain. You can refine your cadence during training with single leg drills and dedicated cadence work during tempo workouts. Also focus on smooth transitions in and out of the saddle and keeping your pedal stroke fluid as the terrain changes. 7. Get comfortable being in the air. Often times off-road rides include rock drops, ledges, jumps and other features that can take your tires off of the ground. You don’t have to be comfortable flying through the air, but you should be confident in handling smaller features. Start small and work your way up. Work on pulling your front tire off the ground and carrying your speed through the landing. It’s usually not as scary as it seems! 8. Take the cleanest line, not the hardest. Work on picking the cleanest and most efficient lines through rough terrain. Often times the best line is not necessarily the hardest or most challenging. Carrying speed through challenging sections is more important than performing hard maneuvers in order to get through it. Ride clean for the best results. 9. Don’t forget about strength training. Mountain biking is physical, and requires the engagement of many more muscles than just your legs. A strong upper body and core are critical, especially as the trails become more challenging. Focus on a strong grip, arms, shoulders and trunk to make it safely through tough trails. 10. Develop proper braking technique. “Feathering” your brakes before you get to tight corners, or during sustained downhills is the objective. You don’t want to lock up your brakes and drag your rear wheel through every turn or all the way down a hill. Also, don’t forget about your front brake. Often times the tendency is to exclusively use your back brake, but the front brake provides excellent control and stopping power when used properly. Modern mountain bike brakes have tremendous modulation and adjustability. Know how to use them, and they’ll be your best ally. Mountain biking is a dynamic sport that requires speed, finesse and fitness. Often times in pursuit of speed and fitness we lose sight of the finesse, and forget to hone our handling skills. Riding technical terrain confidently will not only make you a better racer, but it will enhance your experience on the bike and you’ll have fun no matter what trail you’re on. By implementing these 10 tips to improve your mountain biking skills, you’ll become a stronger and more confident rider— regardless of what the trail throws at you.